We have discontinued RapidFire Lite. We recommend Glovius CAD Viewer. Glovius is a modern 3D CAD viewer available on Windows, iOS, Android, and Cloud. It’s easy to use and simple interface is ideal for non CAD users. 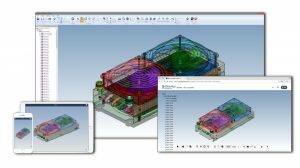 View 3D files without a CAD license. Save on license costs. View 3D, attributes, PMI, GD&T and model views. Navigate, Measure, Section, Analyze, Compare and Export with Glovius. View popular 3D CAD files with one application. Go mobile. View and showcase 3D files on the go. Free 2D viewer with support for CATDrawing files. Glovius is available in English, German, French, Japanese, Spanish, Portuguese, Chinese and Korean languages. For Existing customers – Your RapidFire Lite license will continue to work as is. We strongly recommend you upgrade to Glovius CAD Viewer. For attractive upgrade offers, write to us at support@glovius.com.